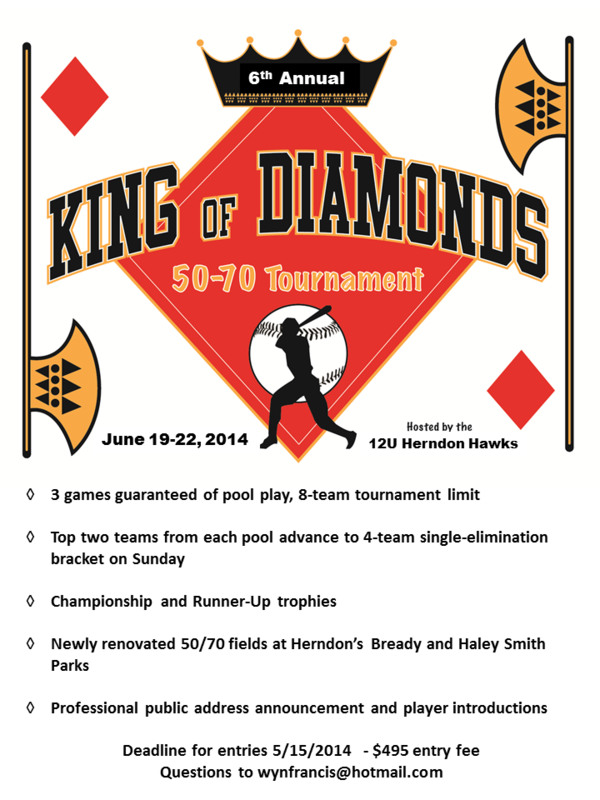 Click here to order your official King of Diamonds 2014 t-shirt--only $7.50!! ROSTERS: Rosters are due to Tournament Director at check-in. Team managers must bring Babe Ruth cards or copies of birth certificates. RAIN POLICY: If the full tournament is canceled due to rain, teams will receive a full refund less $50. If only one game is played, teams will receive full refund, less expenses for game played. If two or more games are played, there is no refund. TIME LIMIT: 6 innings or 1 hour and 45 minutes, except for championship game or tie games. (New inning may not start after 1 hr. and 45minutes). In the event of rain, 4 innings will constitute a complete game or 3 ½ if home team winning. RE_ENTRY RULE; A starting player may withdraw and re-enter once, provided said player occupies the same batting position. A substitute who is withdrawn may not re-enter unless an injury occurs. The injured player, once removed from the game, can not re-enter. PITCHING RULES: Pitcher may not pitch more than 6 innings in consecutive games. One pitch in an inning constitutes an inning pitched. Balks will be enforced without warning. Pitchers may not reenter after they have been removed from the mound. PRE-GAME MEETING: The Pre-Game meeting shall be conducted 10-minutes prior to the scheduled game time; “Managers” are required to attend. Line-Up Cards shall be reviewed and approved by the Plate Umpire. NO changes to the batting order are allowed after approval, any team members (“substitutes”) not listed on the card are considered ineligible. NO addition of “substitutes” to the card shall be allowed after the first pitch of the game. COURTESY RUNNERS: Courtesy runners may be used for the pitcher and catcher at any time. BASEBALLS: Tournament host will provide 3 new balls before the start of each game. MALICIOUS CONTACT: Will result in the player being called out and ejected from the game. No head first slides allowed, except when diving back to the base. Umpire’s decisions are final. Any coach arguing malicious contact will be ejected. Safety first! SEEDING: Seeding into single-elimination brackets will be based on record during pool play (Win = 2 points, Loss = 0 points, Tie = 1 point). Ties will be broken in the following manner: (1) Least runs allowed; (2) Most runs scored; (3) Head-to-head, if applicable; (4) Coin flip.